An Italian town has a novel approach to cracking down on sidewalk poop. Officials in the small Italian town of Malnate have a novel approach to finding out which dog owners don't clean up after their pets: use the dog's DNA. Earlier this year Malnate's environmental department asked all dog-loving residents to register their pups in the city's database. The city’s 2,156 registered dogs had to submit a saliva sample and owners who did not voluntarily bring their dogs within the allotted time were fined $58 for non-compliance with the new ordinance. The problem of dog excrement has been a headache for city officials in Italy and all across Europe. Heavy fines have been put in place but it can be difficult to enforce the law unless the offending dog and owner are caught in the act. 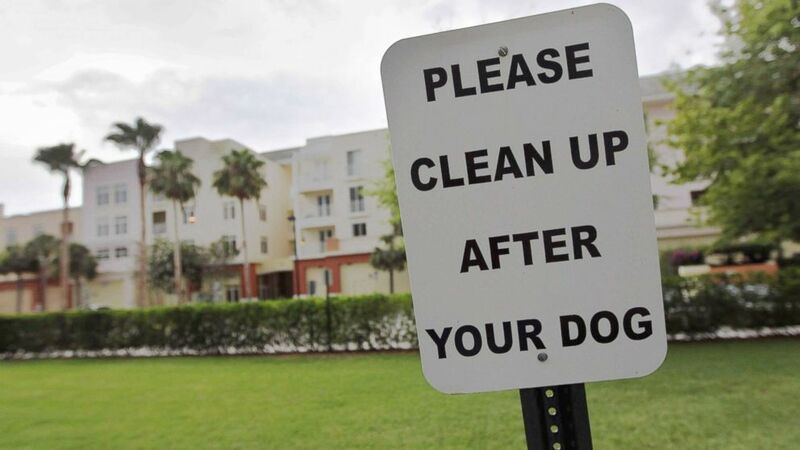 (Joe Raedle/Getty Images, FILE) A sign is posted reading, " Please clean up after your dog"' in The Village of Abacoa condominium complex in this June 30, 2011 file photo in Jupiter, Fla. In Malnate owners who forget or refuse to clean up now know they can be tracked down. "The deterrent effect is considerable. Knowing that the local dogs are now recognizable has led many of their masters to behave civilly and the sidewalks are cleaner," Giuseppe Riggi, Malnate's environmental commissioner, recently told reporters. "At the same time, pet owners thank us because now the other citizens look at them with less distrust." City officials estimate that the dog population in Malnate increases by 150 dogs each year. The plan is to work with local veterinarians to collect DNA samples from the new arrivals in order to keep the saliva swab collection up to date. So far the town has collected 12 samples that were left on local sidewalks and a laboratory was able to extract DNA from nine of those. Then by cross referencing the DNA with the town's records, seven matches were made and fines were sent to the owners. Malnate has received requests from 83 other municipalities across Italy about the program. “They are only waiting to see if the fines will pay for the costs,” said Riggi.